Balance Sheets should balance. | Changing lives. Empowering people. One life at a time. Balance Sheets should balance. – Changing lives. Empowering people. One life at a time. Body-building, like LIFE, is about balance and symmetry (harmony). All the muscles need to flow and you ‘paint a picture of the ‘flow of muscle’ when you’re on stage. Building muscle is hard but not as hard as attaining balance and symmetry. I have had some experience with balance sheets, my first university degree was in Business. I also spent a number of years working for large multi-national corporations advising and consulting towards best practises. If there is one thing I know very well with balance sheets, it’s that balance sheets should balance. Right? The right side must equal the left. Debits and credits should balance. We constantly read and see in the daily news large corporations going ‘bust’ or even countries in recent times, sometimes not just Third World countries. Big banks who loaned out monies to help finance these businesses or countries have to suddenly ‘write-off’ millions and millions of dollars for debts gone bad. They would have likely set a provision for bad debtors in their balance sheet in the likelihood of debts not being recovered. When a bank does this, it is known in accounting as good practise and in compliance with accounting standards. The lenders are said to be prudent. I have always wondered what it would be like if this approach should also be applied to us individuals, in every area of our lives. I mean if some person has done you harm, must we retaliate with the same or worse force? Or should we set aside a provision (like doubtful debts in the balance sheet) for such actions to be ‘written-off’ against and forgiven? There are many examples over the last two decades at the least, of companies demonstrating how accounting can be more of a creative art than a science. Balance sheets should balance like a great body-builders physique should be balanced and harmonious (symmetrical). As a Christian I was told in my early years of religious teachings that I will be held accountable for all my actions (sins and good) before entering the kingdom of heaven. This was my first introduction to balance sheets. It seems that most if not all religions have similar teachings about each individual’s accountability at the end of his or her life. I have always thought that if this were the case and that most of us believe it so, then maybe, it would be a good idea to stop, reflect on past transactions (like a good Accountant), and draw up a ‘personal balance sheet’. .. balance sheets should balance. You will find that there are some amongst us that just take and keep taking, with very little to give. I’m not talking about money here, even though this could also be considered in this point. I’m referring specifically to a person’s spiritual balance sheet. Your spiritual net worth, when you are held accountable at the gates of the after-life (whatever religion you follow). What if God came through and acted like the large banks, with proper accounting practises of ‘writing off’ bad debts? What if your spiritual net worth was in the negative (in accounting terms)? Should you be collapsed like business gone bankrupt without any chance to continue? Should your life end, right there? Should the receivers be called in? Or do you think you should be given some ‘slack’ because you hope to get better and can expect to get in spiritual surplus in the next accounting period? I know I prefer the latter. I’m sure we all do. Aren’t we all fortunate that we have such a God? It nice to know that that is how God operates, isn’t it? Your sins (and mine) and all the bad debts(deeds) will be forgiven. Forgiven but not forgotten. He sent his only begotten son to live and die amongst us so that all sins may be forgiven, for all of time (this is our provision for doubtful debts taken care of). This is prudent spiritual banking but very smart banking, I think. 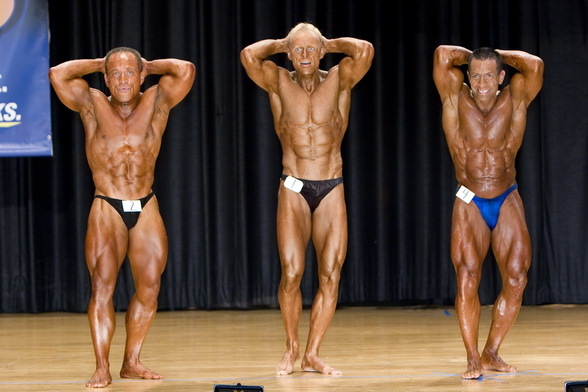 Abdominal/thigh pose with the top 2 Natural Bodybuilders in the world in 2007. “Balance” and symmetry is a big part of a top bodybuilder’s winning physique. So, I’ll ask again, what is your balance sheet, your spiritual balance sheet? Do an interim set of your spiritual balance sheet to assess how you’re going. It may just help you lower the risk of sinking to a spiritual net worth deficit. Not a good place to be. If you’re in this predicament, seek ways to start ‘giving back’ to life to balance off what you have ‘taken’. Seek balance in your life, spiritual balance. Balance your spiritual balance sheet and watch how more balanced life will love you back. Spirit, after all equates with or equals LIFE. Specifically quality of life. When you lose your spiritual balance, you lose or lack those qualities we all refer to as spiritual. You become devoid of humanity, love and self-respect. At the worst, you may become selfish or even violent. So, don’t leave it until it’s too late. Do an interim spiritual balance sheet TODAY. I believe if you do so, it will help you align YOU with life better, with the life’s energy. Work towards your spiritual net worth surplus. All the best in your spiritual journey. Overcoming many small hurdles on your way to achieving your ultimate goal is encouraging. Progress, any form of progress – especially spiritual, is a motivating factor. So, don’t strive for perfection, instead seek progress … towards your ideal SELF. Seek spiritual balance. It will align you with life’s energy better. It will help you get internal/external balance. → Focus on the muscles you don’t see in the mirror.